I think I'm having an panic attack right now. So eReaders! Help! I need your advice on which eReader to purchase! I'm thinking a Kindle, but there are so many kinds! And for your input, we're offering a chance to win a $10 Amazon Gift Code for you. If you don't own one, tell us which one you'd want. I like the Nook because my stepdad works for Barnes & Noble and has shown it to us before. It can do some pretty cool stuff, like read kid's books out loud (which would be pretty neat during a long car trip). But I think I'd go with the iPad because it can do lots of other things too, aside from being a book reader. Hi! 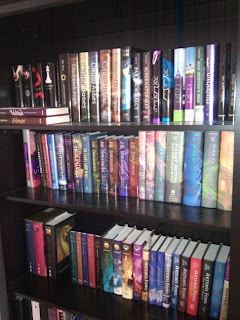 =) I'm not entering the contest (because I know nothing about ereaders), but I wanted to tell you that your bookcase looks gorgeous! I can't imagine a lot of classic YA/MG covers looking so good in bookcases painted black, but all the ones you have there are like jewels on velvet! Love your site by the way! Thank you for dropping by last week! I'd definitely pick up a Nook. I have a Nook Color and though it's had a few ups and downs, it's still my favorite. It's so versatile and way less expensive than an iPad. Of course if you have money for an iPad I'd probably go with that, though then you fight with other distractions. Good luck! and love the book shelf! My daughter says the Nook is the one to get. She enjoys hers. Thanks for the giveaway. 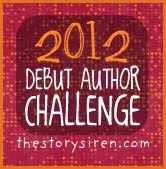 We've decided to not make the "tell us your favorite ereader" mandatory...so come and enter now!